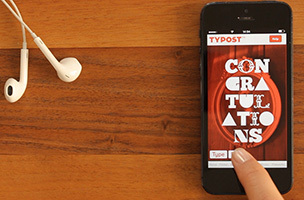 Aiming to give instant messages more style on iOS, iPhone app Typost allows users to utilize different fonts to create typography for sharing on social networks and more. The app offers multiple font sizes, colors and more, and supports importing images from the camera roll, among other features. When creating an image, users type their desired text, from a typical greeting to a promotional message, or even a meme. After typing the text, users can edit the image via a variety of gestures. Swiping changes the font type, pinches change the size of the font, double taps can activate color wheels for changing the color of either the background or the font, and five animations can be added to make a message move. The app also supports importing images for the backgrounds of messages when creating themed promotional banners, meme images or other image-sensitive posts. Once complete, messages are saved to the cloud with a unique URL for sharing with others via direct URL, or on Facebook or Twitter. While the app was originally released last fall, it was recently updated with additional capabilities, including the ability to send messages via SMS or email, or simply save finished images to the device’s camera roll. Typost is available to download for free on iPhone. Check back soon to follow the app on AppData, our tracking service for mobile and social apps and developers.